Sports Engine LLC's MOTOR TABS Fluid Replacement System, the official sports drink of Ironman triathlon world champion Michellie Jones and several well-known triathlon and cycling teams, has introduced two new items for 2008, including a 12-count variety box and a 24-ct. Grape box. Both items will be available in March at bicycle, multi-sport and running retailers. "These new offerings are direct results of listening closely to consumers, elite athletes, trade partners, and product testers," said Greg Sellers, Sports Engine's manager. "Responding to market demands is an important facet of our long-term growth strategy." The 12-ct. variety box features an SRP of $17.99 and contains three of each flavor of the effervescent, drop-in-water sports drink tablets: Fruit Punch, Lemon-Lime, Orange, and Grape. The individual flavors are also offered in 24-ct. boxes (including Grape) and as singles  sold out of the MOTOR TABS fishbowl - at select retailers. MOTOR TABS is a fully portable, true sports drink that can go anywhere, as the tablets are individually wrapped in water/air tight foil packages protecting them from sweat, dirt and other harmful elements. Whether it's on the bike, run, hike, gym or at work, MOTOR TABS restores vital fluids that are lost during physical activity or illness. As a "foundation" sports drink, MOTOR TABS is lower in calories than many powdered or ready-to-drink sports beverages, easier on the stomach and designed to hydrate and re-hydrate during sports or fitness activities, or when supplemental electrolytes are needed. Each tablet contains an optimal ratio of sodium-to-potassium and an optimal carbohydrate energy blend of dextrose, sucrose and maltodextrin  250mg sodium, 75mg of potassium, 16g carbohydrate and 65 calories. 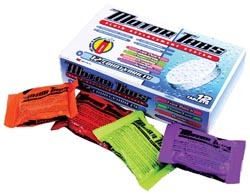 MOTOR TABS does not contain aspartame, sucralose, acesulphame potassium or high fructose corn syrup. Athletes may customize each bottle based on individual fluid intake requirements by using one, one-and-a-half or two MOTOR TABS for every 16  20 ounces (473 - 591mL) of water. Once the tablets dissolve  just a few minutes in room temperature water - there is no sediment or residual settling, as dissolution is complete. Cleaning bottles and hydration systems is easy as well. In 2008, the brand will support pro and elite amateur triathletes and cycling teams, including Michellie Jones, who won the 2006 Ironman Triathlon World Championship in Hawaii's punishing climate drinking MOTOR TABS, and triathlon legend Spencer Smith. MOTOR TABS is the official sports drink for the following top programs: Inferno Racing, BMW-Bianchi Elite Women's Cycling Team, Cheerwine Women's Elite Cycling Team, Kalyra Women's Cycling Team, Pasadena Athletic Association Professional Cycling Team, Socalcycling.com's Elite Cycling Team, Orange Country Tri Club, Breakaway Training, and San Diego X Team. MOTOR TABS is currently available in nine countries outside of the U.S., including Australia, Canada, Mexico, New Zealand, Puerto Rico, Singapore, South Africa, Spain and the United Kingdom.